During the mid-sixties, the London quartet ‘The WHO’ had a string of top-selling albums including the 1969 TOMMY- a collection of songs about a pinball-playing boy. Pete Townshend, who played guitar & did the vocals, got together with director/composer Des McAnuff to turn the record into a rock musical. Opening in 1992 at McAnuff’s La Jolla Playhouse, it was an immediate success and earned Tony™ awards for both creators as well as some of the performing cast-members. For CITY CENTRE MUSICAL PRODUCTIONS to undertake staging such a challenging enterprise takes mettle, and a director who can grasp the almost religious allegorical message subtly intrinsic in the plot. Choosing Katherine Kormos was a virtuoso selection; she seems to comprehend the intent behind what Townshend & McAnuff wanted to scrutinize…trauma and the psychological manifestations thereof. During WWII; a young RAF captain parachutes into Germany; is captured and presumed dead. His pregnant wife gives birth to a son, and a few years later takes on a lover. The missing captain returns; finds his wife with her beau and kills him. The son witnesses the murder in a mirror but is struck catatonic. The captain is acquitted but young Tommy shows no emotion at the verdict. Most of the foregoing is not only sung & acted but is elucidated through clever artistic, overhead projections by Wendall Harrington. The extended dysfunctional Walker family (uncle, cousins etc.) misuse the mute & blind boy until it’s discovered that he is a pinball super- genius. Medical advice; parental affection, even talented sexpot therapy fails to remedy the boy’s affliction. Only the breaking of said mirror frees him. And then, other social problems attach themselves to his notoriety. There are, by necessity, three Tommy’s:- an adorable 7-year old Gabrielle Greico plays him as age four; the almost dialogue-free Mackenzie Faulkner portrays him at age ten; while a dynamic Daniel Brenner IS the Tommy character, as well as narrating the play’s progress. All three iterations manage to project their character’s problems and challenges. To witness the focus and discipline of Tommy #1 will certainly provide hope for all us “O.F.’s” future! That Faulkner can manage to appear almost Zombie-like and then exude such passion when confronted by the electric apparatus; all with just stance and body language, is pure theatre. Brenner is the pivot influence even when he’s not stage-front & centre. The two parents played by Paula Gonzalves & Steve Kirk both contribute full measure of love, dedication and even frustration with their socially comatose offspring. Each possesses a fine voice and the ability to facially accentuate their lyrics. The other lead character is the pinball machine itself (hand-built by Wade Pitman & Mary Rose of ‘Oakville Players’) whose lights, gewgaws, and electronics are worthy of R2D2, steal the audience’s attention whenever Tommy gets it (him?/ her?) excited! Katherine MacKenzie as the Gypsy seductress whose ‘Acid Queen’ number is ‘R-rated; plus the plaintive question posed to the star by Cassie Roy as Sally are stand-out solos. The two chorus biggies are ‘Sensation ‘ in Act I and post-interval, the heartfelt ‘Can You hear Me’ number sung & danced in a London street. This is a BIG play…big cast; big challenge; big stage-crew demands & big sound! Michael Grieco’s eight-piece orchestra coupled with speakers that surround the Meadowvale audience put us well into the on-stage action, but never hurt the eardrums and only in rare moments drown out the performers. The costumes; choreography and lighting are all of professional quality and standards. Certainly this CCMP effort is on a level equal to what one expects out of a Toronto – King Street presentation. 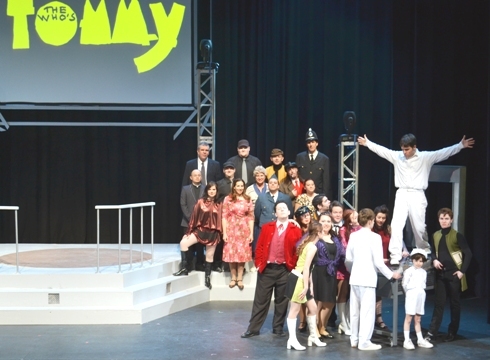 So, “TOMMY” and company deserve a big audience! On stage until SUNDAY, Mar. 24th, Call 905-615-4720, ext. 2588 to arrange tickets. “TAKING SIDES”, a professional–level production. Editorial notice to our readers and subscribers -2nd request!